Story: The Liquifier was a creature that roamed the sewers of New York. It got it's name from the way it liquefied it's victims before eating them . The Liquifier was believed to have died when ShadowHawk found him hunting a human and ripped his heart out . It later turned out he had survived. He was last seen when Vortex apparently blew him to pieces  but he might have survived again. 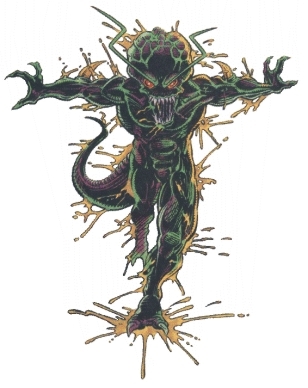 Skills & abilities: The Liquifier secreted a substance, which dissolved flesh so he could eat it.